A super summer salad made with a combination of romaine lettuce and spinach that is mixed with strawberries, blueberries and almonds for a nice blend of flavors. 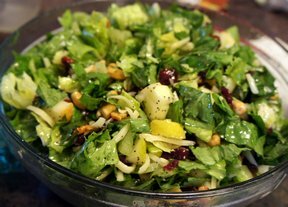 This salad is tossed with a sweet and delicious Lemon Poppy Seed Dressing that brings the whole salad together. This is a great summer salad but it is so delicious that you will want to serve it throughout the year. Tear lettuce into bite size pieces and combine it with the spinach. Toss in almonds, strawberries, and blueberries; set aside. Mix sugar, lemon juice, onion, mustard and salt in blender. Add oil slowly and blend until thick and smooth. 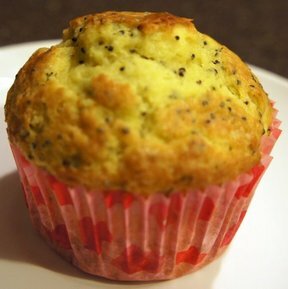 Add poppy seeds and process a few seconds to mix. Refrigerate the dressing until you are ready to serve the salad. When ready to serve, drizzle dressing over the salad and gently toss to coat evenly. Note: Do not add all the dressing at once. Gradually add to the salad until it is coated as desired. 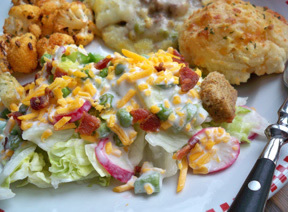 The leftover dressing can be refrigerated for several days and used as a dressing for a regular toss salad. 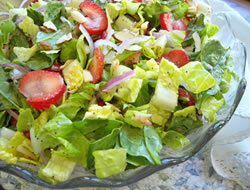 "I had never made a salad like this before and tried it this last weekend when I had some friends over. I just served this with grilled chicken breasts and everyone thought it was great. There were only four of us but we almost ate the entire salad. I will definitely make this salad again."